On The Trail of Trophy Pike. Hello all fishing lovers, Today’s post is “On The Trail of Trophy Pike”. We hope this post is useful for you, all fishing lovers. north camps you can fish in Ontario. that stretch past 40 inches and weigh upwards of 20-25 pounds are rarely an easy mark. It’s not so much that these fish are rare, but that most anglers don’t know how to search out the waters where these jolly green giants are abundant. and the odds of survival are on their side. Seeking out remote waters that see little fishing pressure is one of the most important points to locating good pike water. The types of waters that best fit this category are the countless remote fisheries found throughout Ontario. and camera guy Aaron Word taking a break from the action. Just as important as spawning habitat is good living habitat. Large bays that have soft bottom areas and plenty of weed growth are important for supporting a good pike population. These are the places that hold significant amounts of baitfish and pike spend most of the early spring months living in these waters. Forage is the next key ingredient to producing significant numbers of big pike. Many lakes across Ontario support good populations of pike and walleye, but some lakes have little in the way of forage species for these fish to feed upon. Pike grow best when they have an abundant forage base of soft rayed fish like suckers, whitefish and ciscoes. In lakes where the forage is primarily yellow perch or small walleye, pike rarely grow big. A diet of these spiny rayed fish will support pike, but the growth rates suffer and few big fish are found in these waters. The saying goes that timing is everything. In the case of northern pike fishing, timing is critical for several reasons. Pike concentrate in the shallow and marshy areas of the lake during spawning and for several weeks after spawning. These marshy areas are easy to locate, making the search for prime fishing waters a no-brainer. Unfortunately, big pike don’t stay in the shallow water bays for long. As soon as the water begins to warm above the 50-60 degree mark, big pike start abandoning shallow water in favor of cooler main lake waters. Big pike are highly temperature sensitive, whereas smaller pike will live in warm shallow water year around. Fishing the shallows after the big boys have moved deep will produce nothing but “hammer handle” pike. Depending upon the latitude, the prime times for Ontario pike fishing range from late May into mid June. 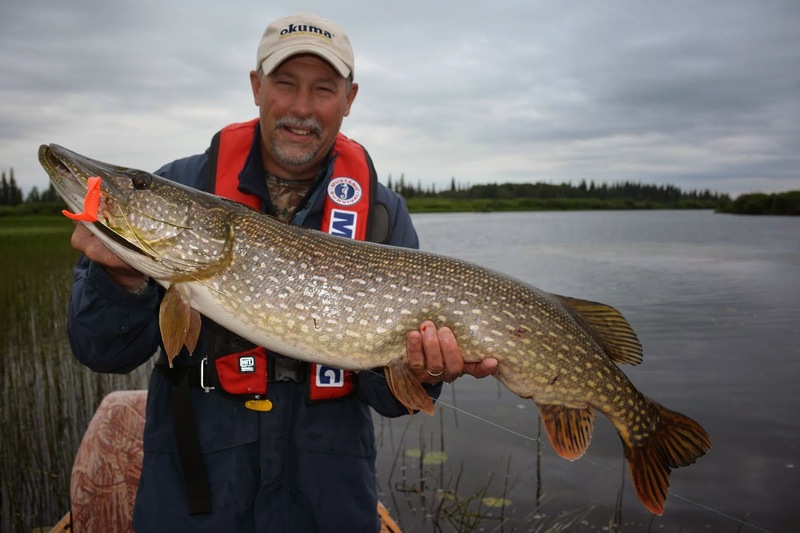 In the far north, some excellent pike fishing takes place through June into early July. During the middle of summer, big pike can still be targeted, but because these fish are dispersed throughout the lake, it’s more difficult to find numbers of fish. he will remember for the rest of his life. When big pike are found in shallow water, they are typically aggressive and willing to bite a wide variety of lure types. Bucktail spinners, spinnerbaits and monster spoons are common fishing lures that have produced countless trophy pike. When conditions are right and pike are on the bite, it’s hard to deny that these baits catch lots of fish. Unfortunately, fishing conditions are rarely ideal and catching trophy pike requires thinking a little outside the box. My favorite pike lures focus more towards baits that can be fished slowly. Bucktails, spinners and spoons must be retrieved fairly quickly to generate the desired action. Fast moving baits lead to a lot of follows, short strikes and missed fish. Giant jerkbaits and soft plastic creatures fished on jigheads or Texas rigged are my favorite spring pike lures. Big jerkbaits (my favorites are saltwater baits) have the advantage of being produced with “pike sized” hooks and these large lures are difficult for pike to completely inhale into their mouth. This makes it easier to unhook and release fish. The Rapala Husky Jerk 14 is about the smallest jerkbait I’ll throw for trophy pike. Better yet saltwater or musky versions produced by Yo-Zuri, Bomber, Salmo, Musky Mania and other brands. Hard body jerkbaits can be casted long distances and twitched to create an erratic darting action. Ideally these lures should be fished near the surface and over the tops of emerging weed growth. This fishing strategy prevents snags and also helps to monitor how fish are relating to these lures. If a number of fish make half hearted attempts to strike these lures, that’s a sign that a more subtle type of lure may be required. Large plastic creatures fished on jigs and Texas rigged are ideal for targeting pike that are reluctant to bite jerkbaits or other lures. 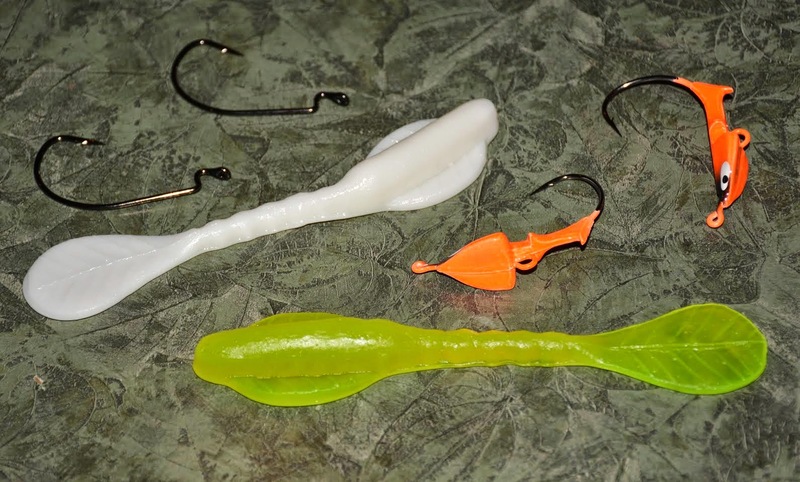 The advantage of fishing plastics is these lures are exceptionally life-like and they can be rigged to sink very slowly. A jighead with a large hook is essential to fishing these soft plastics. My favorite jighead is produced by Bait Rigs called the Esox Cobra. This jighead design features a wedge shaped head with an eye tie that comes out the nose of the jighead, making it much easier to snake the jig through weed and even wood cover. The oversized wide gap hook bites through even large plastic baits and molded in is a barbed collar that insures the grub body or other plastic used will stay in position tight against the jighead. best in heavy or emergent cover like cattails and bullrush. In sparse to moderate weed cover I favor the jig rigging method. When I’m fishing a jig and plastic combination, I keep my rod tip about face high and allow the jig to sink to bottom on a slack line. When the jig hits bottom, I twitch the jig towards the surface using short pops of the rod tip. When I spot the jig near the surface, I lower the rod tip and let the jig glide back to bottom. This simple jigging technique does a good job of convincing pike they’re looking at a dying minnow. Because a lot of strikes come on slack line, it’s important to fish with a fluorescent line you can see. When the weeds are dense or sticking out the surface like cattails and bullrush, the Texas rigged plastic option makes more sense. In this case the plastic is casted to openings in the weeds. Again I use the rod tip to control the plastic, keeping it near the surface in dense cover and letting the plastic slowly drop into pockets and openings in the weeds. For jerkbaits I like to fish heavy “flippin’ stick” style baitcasting rods. A 20 pound plus northern will be a handful on anything with less backbone. On this rod a baitcasting reel capable of handling about 200 yards of 50 to 65 pound test super braid is ideal. I find that eight strand braids like that produced by Maxima are superior in that they have body and lay on the reels spool better. Because Maxima braid is more tightly wound than other braids, it casts better and has considerably better abrasion resistance properties. Jig fishing requires a little different approach. Baitcasting gear can be used to jig fish the larger plastics, but throwing the smaller plastics will require a heavy action spinning outfit and 30 to 40 pound test braid. Most spinning rods simply don’t have the backbone to handle trophy class pike. Saltwater style spinning rods are a good choice. Look for a seven foot rod rated for 10-20 pound test line and match this rod with a spinning reel capable of handling 150 yards of line. Pike are big, but they are very delicate fish. It’s important to photograph and release fish as quickly as possible. Keep your pliers and a pair of side cutters handy for unhooking landed fish. If the hooks are buried deep, I usually opt to cut the hook free using a pair of heavy duty side cutters. It’s a simple matter to replace the hooks on a lure and get back to fishing. When photographing the fish, keep the fish in the net and in the water until everything is ready for the photo. 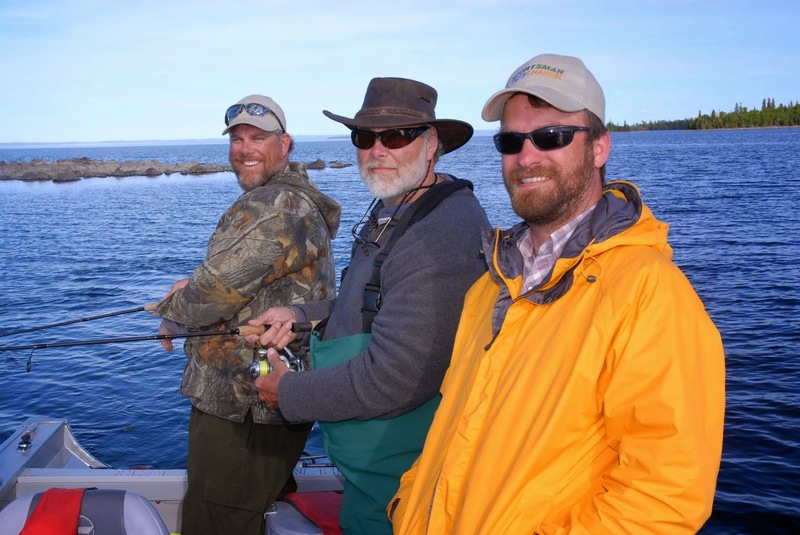 A digital camera works best because you can quickly check the preview button to make sure your picture turned out good before releasing the fish. Releasing trophy class pike is not only important, it’s our obligation. A fiberglass replica mount on your wall will look better than the skin mount and you’ll have the satisfaction of knowing that monster fish is alive and likely to give someone else the thrill of their life. Getting on the trail of monster pike is about finding remote waters, selecting lakes that have good spawning and living habitats and focusing on fisheries with the best forage base. The rest is about timing and a few key fishing tactics that routinely produce pike on good days and bad.